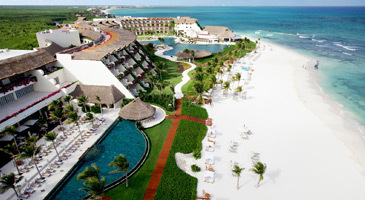 The luxurious Grand Velas Riviera Maya is the newest resort to distinguish Riviera Maya as a premier vacation destination. Hugging the pristine white sand shore of Playa del Carmen, the Grand Velas Riviera Maya is the pinnacle of all-inclusive vacation luxury. Elegant accommodations, a gourmet culinary dining experience, deluxe spa, personalized butler concierge services, and a cutting edge convention center make Grand Velas Riviera Maya an ideal choice for all travelers.